This website is temporarily unavailable, please try again later ko kaise fix kare. Blog Net Book: This website is temporarily unavailable, please try again later ko kaise fix kare. | Blogging Internet Ki Puri Jankari Hindi Me! HomeSeo This website is temporarily unavailable, please try again later ko kaise fix kare. This website is temporarily unavailable, please try again later ko kaise fix kare. Blog website me yeah error dns setting ke karn aha jata hai. Jab domain ko apne blog me set karte samay kuch mistake ho jane per yeah problem face karni fadti hai. Are yeah blog me kuch samay bad hoti hai. Mere kud ke blog per yah problem aha chuki thi lekin mene iske bare me research kari tab jaker This website is temporarily unavailable, please try again later error ka pta chal paya mene google per iske bare me bahut search kara per mujhe is error ke bare me shi information nhi mil pa rhi thi. Fir mene kud koshis karke is error ko fix kar paya .Blog me "This website is temporarily unavailable, please try again later." ko fix karne ke liye niche diye sabhi step ko follow kare. Agar apko is error ko fix kanra hai. "This website is temporarily unavailable, please try again later. sabhi step ko thoda dayan se pade. To chaliye jante hai is error ko kese fix kare. 🔵 website ke deadlink ko kaise remove kare. how to fix This website is temporarily unavailable, please try again later. Yeah problem sirf without www ke blog address ko search karne me athi hai. Agar ham www ke sath blog address ko search kare to hamara blog open ho jata hai. Per hamre blog website me khoi problem nhi honi chaliye to is error ko kese fix kare niche diye sabhi step ko follow kare. 1. Ab setting per click kare. 2. Now Basic per click kariye.Are blog address ka open open ho jayga. 3. Ab jisa image me "Redirect blognetbook.com to www.blognetbook.com." per hai. usi trah se. File ko save kar le. Ab apne jis bi kisi website se domain nam liya hai. us open kare. mene Godaddy se domain liya hai me godaddy per hi error ko fix karne ke liye batunga. Ab apne Godaddy account me login kare. 1. Ab apka account open ho jane per "My Product" per click kare. 2. Ab domain pannel open jayga. Ab "Manazge" per click kar de. 3. Ab next page per "manazge conection per click kare. 1. Manage per click karne ke bad dns file zone par click kare. 2.Ab More Per click kare. 3. Ab Import zone file per click kare. Ab apne jo file pahle dawnlod kari uske yah per upload karna hai. 1. Ab file ko select kare. jo dawnlod kari hai. 2. i understand this wali line per tick kare de. 3. Finally ab save kar de.ab blog address ko google search bar me search ke check kar le. Ab ap blog ko open karke dek le agar iske bawjud bi blog ko open na ho to hame comment karke batye. 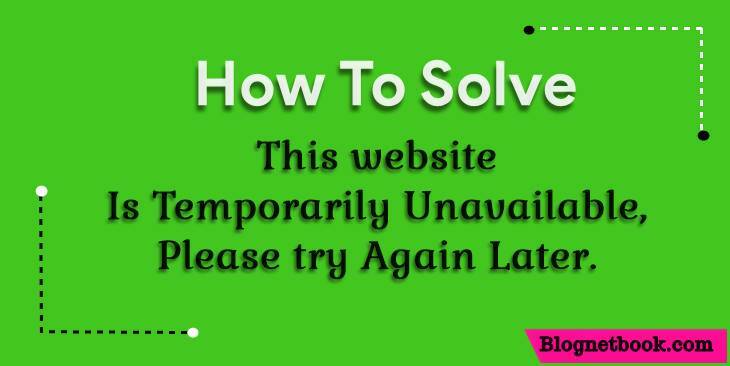 Agar apko hamri yeah how to solve This website is temporarily unavailable, please try again late. .artcle se sach fayda hua hai. to hare blog ko social media are apne friennd ke sath jarur share kare. i hope apko article acha laga hoga. to comment karke jarur batye. 🔵 Blog website ke backlinks kaise check kare.